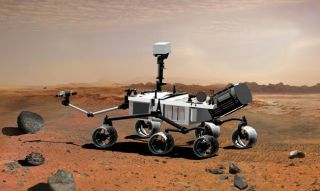 NASA's Mars Science Laboratory, dubbed Curiosity, is now moving from problem child to a ready for action robot. Launch is set for 2011. The latest Mars robot may be dead, but NASA scientists haveplenty to keep them busy as they scout out four potential stomping grounds for anambitious new rover pegged to be the next red planet explorer. NASA declared the PhoenixMars lander ? its youngest Mars probe ? officially dead in late May afterphotos taken of it from orbit revealed substantial damage from its environmentin the Martian arctic. Those photos came from the same powerful orbiter thathas been searching for the ultimate drop zone for NASA's new MarsScience Laboratory (MSL) which is currently set for a November 2011 launch. The new roving robot lab, known as Curiosity, is expected todetermine whether Mars is or was ever habitable to microbial life. The rover'scombination of technical improvements should make any potential landing sitesmore scientifically rich than anywhere Mars landers have gone before. NASA is closing in on the end of a long process ? whichbegan three years ago ? to poll? ?the Mars science community for potentiallanding sites, then weigh the pros and cons of each. Now, out of some 60 possible sites considered at differentstages of the process, the list has been whittled down to four. They are regionsof Mars known as Mawrth Vallis, Gale crater, Holden crater and Eberswaldecrater. "These are the best placesyou could possibly imagine you would want to go, and for the first time, youcan actually land near them and get to them," said Matthew Golombek ofJPL, co-chair of the Curiosity rover landing site steering committee. The Curiosity rover is the first Mars mission ever built touse a guided entry, meaning it will steer itself through the Martian atmospherelike a guided missile instead of flying passively like a shuttlecock. Becauseof this, the spacecraft can hit a much smaller landing target than ever before. NASA's Viking missions required landing zones 190 miles (300km) long to account for possible drift as the craft descended through theatmosphere. Having to find a safe area of that extent ? free of craters, cliffsand rocks ? drastically limited the potential landing sites. ?Later, the MarsPathfinder mission and Spirit and Opportunity rover landings worked with targetellipses 60 miles (100 km) long. The Curiosity rover, however, is designed to hit a target justover 15 miles (25 km) long and 12 miles (20 km) wide. "It opens up a lot morepossibilities of squeezing the ellipse within the terrain and closer tofeatures of interest," said Vasavada. After landing, Curiosity will alsobe able to drive up to 20 kilometers to reach targets, or "go-to"sites. The new rover is also built to decelerate faster thanprevious missions, meaning it can land on more elevated terrain, which opens upeven more of the red planet for exploration. And because Curiosity lacks solarpanels and is designed to withstand severe cold temperatures, mission plannerscan target anywhere from thirty degrees North to thirty degrees South latitude. Where to land on Mars? These broader landing possibilities give researchers roughlyhalf the planet to choose from, or triple the area open to Spiritand Opportunity rovers. To zero in on the most interesting landing sites,Mars scientists made use of data collected from orbit. In 2005, the OMEGA spectrometer on board ESA's Mars Expressorbiter picked up the presence of phyllosilicates ? clay minerals that formedin the presence of water ? on the Martian surface. For the past few years, MarsReconnaissance Orbiter (MRO) has been mapping those phyllosilicates at highresolution. All four of the landing sites under consideration containlayered phyllosilicates, which must have been deposited over a period of time.Vasavada said the phyllosilicates are all found in terrain that dates back toroughly the first billion years of Mars history, known as the Noachian era.Curiosity will be the first rover to land on such ancient terrain. Ideally, Mars scientists would like a landing site in whichthey know going in how the phyllosilicates were formed, to be sure they canconstruct a complete story of the features Curiosity will be examining. The most comprehensive of possible landing sites for theCuriosity rover are Holden crater and Eberswalde crater, adjacent to each otherin the Southern highlands of Mars. Based on MRO observations, Holden crater was formed from animpact that disrupted an existing river system. The river eventually brokethrough the crater and flooded it, leaving behind phyllosilicate minerals.Holden may have also contained lakes prior to the flooding, which would haveleft their own traces. Eberswalde predates Holden andcontains something very exciting to researchers ? the sedimentary remains of ariver delta on the western side of the crater. "Here the geologic story isreally tight," Vasavada said. "It's basically a pile of sediment thatwas deposited by a river." Curiosity could be used tofigure out how long the river system was running, what kind of sediment wasdeposited and where it came from. River deltas trap sediment along withorganisms and organic molecules, which are all the things mission scientistswant to study. "The downside,"according to Vasavada, "would be that the delta may have only been activefor very short time in Mars history." Riskier from the perspective of geological understanding butpotentially more rewarding in terms of mineral remains are Mawrth Vallis andGale crater. Mawrth Vallis is one of the oldest valleys on Mars, formedapproximately 3.7 billion years ago. It also contains the best-exposedphyllosilicates on Mars. In images from MRO's CRISM instrument, scientists haveidentified multiple layers of phyllosilicates made of different materials. Someare rich in iron and magnesium; others are rich in aluminum. "It suggests a change in environment, a change inchemistry" when Mars was warmer and wetter, said Golombek. "All ofthat is incredibly interesting to go look at." What Mawrth Vallis lacks is an understanding of how theminerals got there, Vasavada explained. "That's something we coulddiscover by putting a rover there and driving around, [but] we would like toknow that before." A similar situation holds for Gale, a 90-mile (150-km) widecrater near the bottom of Elysium Planitia. Some 3.5 to 3.8 billion years old, Gale contains a mound ofphyllosilicates in the middle that towers 3 miles (5 km) high ? higher eventhan the crater's rim. At the top of the mound are younger sulfate minerals,which would have formed in more acidic water than the phyllosilicates belowthem. If Curiosity landed at Gale, it might be able to survey abillion years of Mars history, Vasavada said. The only problem, he added, isthat researchers can't be sure whether the minerals were deposited by water orair. "Everybody's wishing we had the perfect site where wecould sort of do it all," said Vasavada. "Really there are strongsupporters behind each of these four sites for different reasons." At the next landing site workshop in September, researcherswill continue debating the pros and cons of the four sites, including how longit will take Curiosity to reach the phyllosilicates in each case and thepotential pitfalls along the way such as cliffs and rocks. "If it takes ayear to drive out of the ellipse, that's a factor you have to take intoaccount," said Golombek. The final recommendation won't come until next May or June,after MSL scientists construct simulations of the surface conditions followinga fifth workshop next March or April. After that, it will be up to NASA'sAssociate Administrator for Space Science to make the final decision. It's too soon to make an informed choice, said Golombek. "The science is only half of the issue. I don't think we fully understandall the potential hazards yet."